This copper stamped and eteched bracelet is hollow with a back plate. This bracelet measures 3/8" wide. 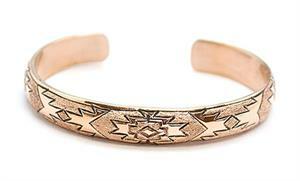 Native handmade by Navajo artist Florence Tahe. Stamping and etching will vary.